23.07.2004 A.Shashin. CHESS PLAN – FICTION OR REALITY? Starting the attack I must warn that I`m perfectly armed and quite "dangerous". I have in my arsenal ultra-modern methods of third millennium science. I`m armed within the limits of my strength with "ideology" and "technology" of the scientific theories, which pretend to describe "Everything in the world". The problem is in the choice of an "absolute weapon" that would be appropriate for our target. It`s always expedient to attack the most sensitive and the weakest spot of the enemy. That`s why the first, all-out and straight-out attack will be the attack on the chess plan in those chess positions, where irrational complications dominate. A plan is out of the question in them, it is nonsense there. At first let`s talk about irrational complications! The answer: because irrational complications and the concomitant attacks of material targets are closer to true and ungarbled nature of chess game. I identify the later with the nature of the chess chaos. Chaos is primary. Chaos in chess is an infinite and primeval set of all possible chess games, i.e. allowed by the game rules. I repeat: all chess games without exception, with senseless games among them! It’s important that chaos is capable of self-arranging. The order is the secondary. I`d like to add that transition from chaos to order occurs by itself, i.e. spontaneously, without external influence on the complicated dynamic system. It`s internal system`s parameters that act. These parameters are responsible for "everything without any exception"! 1. Irrational complications of the material target attack. 16-th game of the world championship. And then – more than deliberate comments (I remind that our purpose is to discredit the chess plan). b) White, having "pushing upward" the King, increases thereby the concentration of his powers at the King side, as the "minimal" rectangle f1-f4-h4-h1 (the rectangle, inside which there are seven white pieces) has changed after the move 31.¢h2 into the "minimal" square f2-f4-h4-h2, which is smaller in space. 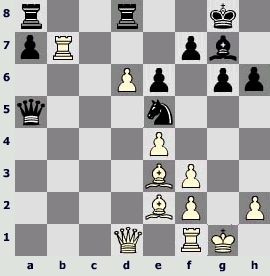 c) Kasparov, using this move, once and for all gets rid of the opponent`s counter-play, concerned with the very unpleasant check on c1. In other words, Kasparov a) attacks, b) plays strategically, c) cuts down the opponent`s aggressive possibilities (preventive measures, i.e. the defense!). All known kinds of chess fight have interlaced with one another into one tangle. There is a threshold of chaos on the chess board! 32... cd3. One of the four(!) possible captures. 33... £a3. It`s a mistake according to Kasparov. It`s stronger 33...d2 and then (look the variants A and B) ...the abyss has yawned! "Three pawns for one piece give White only moral advantage" (Kasparov). The position estimation of the world champion is uncertain, "literary" and quite vague...Perhaps, ²/= ? will be more exact? Or ²? Who will take the risk of estimation the position at the diagram more exact and how to do this? How? Actually, we have only quite poor and unreliable set of tools: =,²,±... Where are the exact criteria of position estimation? And are there any at all? B) 35.£d6 ¢e8 36.£c6 ¢f8 37.£d6 ¢e8 38.£a6 d1£ 39.£c8 ¢e7 40.£c5 ¢d7 41.£c6 ¢e7 42.d6 ¢f8 43.£c8 ¢g7 44.¤f5 ¢h7 45.£f8 ¤g4 46.¦g4 ¦h3 47.¢h3 £h1 48.¢g3 £e5 49.¦f4 g5 50.£f7 ¢h8 51.£f8 ¢h7 52.£e7 £e7 53.de7 gf4 54.¢f4 £g2 55.e8££g4 56.¢e5 £e4 57.¢e4 – stalemate ! According to the most prudent of my arithmetic calculations, the position at the diagram is nothing but one "real" chess position of ... tens of thousands of possible and might-have-been final chess positions. Those positions, in which a chess player stops the calculation of variants and starts the estimation of the situation on the board. One exact position among hundreds, thousands of inexact positions! ...The attack, the counter-attack of the opponent (defense from the point of view of White) and strategical playing have interlaced with one another in the just given fine variants. All together they define so-called intermixing layer – the central concept of the theory of dynamic systems. There rules chaos, reigns uncertainty and His Majesty Chance. And we, the chess players, must fully realize one simple truth: His Majesty Chance isn`t the result of our incompetence or lack of conscientiousness. His Majesty Chance is only the sign of our true ignorance, the sign of the impossibility of absolutely exact estimation of a chess position. The order in chess is the islets of knowledge in the ocean of chaos. We are doomed to ramble through the labyrinths of chess variants. Chess is almost inexhaustible game. And now let us turn to the plan. 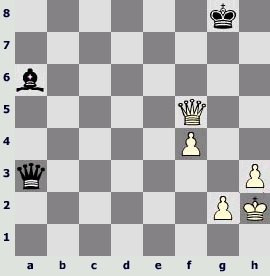 Chess plan in chaotic positions (irrational complications!) is nonsense. Just so, since a chess player loses control over the chess element. We don`t know, what will come next: you cannot embrace the boundless. We, the chess players, while choosing one or another move among the great number of moves that seem to us to be reasonable, don’t know in advance, where the mistake is and where perhaps a divine impulse of genius. None of the most thorough analyses can settle such positions (I recur to the game of world champions). One can only approach for infinitely long time to the inaccessible truth. Infinitely! 34.¤h6. The danger of check-mate on f7. 35.¦g6. The danger of check-mate again, this time on the square g8. 36.¦g8. Check – open attack on the King! 38.¦e8. Checks time and again! Why everything is so easy? 39.¦e5. Getting the material advantage, which is decisive for the outcome of the fight ... and the check again! To attack correctly (including the attack in irrational chess positions) means to attack according to the hierarchical chess sequence. Here is the sequence that is well-known to every chess player: King, Queen, Rook, Bishop or Knight, pawn... The main target is the King! The whole uncomplicated "plan" of an attack consists in that, i.e. in the adherence to the hierarchical chess sequence. I`d like to add to the aforesaid, resting upon the elementary truth of the theory of dynamic systems: the farther the system is away from the state of thermodynamic equilibrium, i.e. the higher its instability, the less is the number of possible predictions (planning) of its future. "The plans" that consider one-two moves forward? ...Here is one more, the second in numerical order and no less enlightening example: the fragment of one of the best world champion games, according to FIDE. 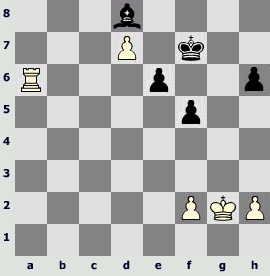 and White, having shown the perfect technique of playing the ending, has won the game at the 47th move (1:0). And now here are my special and purposeful comments (our target remains invariable – the chess plan!). The immediate discredit of it can be guaranteed! 20...¥f8. 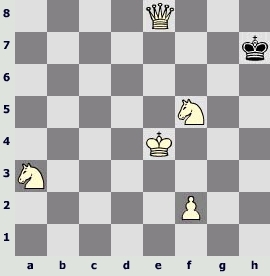 The alternative of the move in the game is the move 20...¦d7. The world champion proceeds with this variant without comments for the moment: 21.¦d7 ¤d7 22.f4, and then turns to the analysis ... of its five(!!) full-value ramifications. Here they are: 22...¦d8, 22...£d4, 22...g5, 22...¦c8 and 22...e5. 5 of 47 possible moves of Black! Coefficient of chaotic state – 5/47 or 11%. 21...£a2. It`s possible be 21...¦db8. 22.¥b5. There occurred also 22.¦e1...(Kramnik – Kasparov, Linares,1998). 22...a6. The continuation 22...¥g7 is also subjected to analysis. 23...¤f3. Khalifman analyzes also two more continuations: 23...¤c4 and 23...£a3. 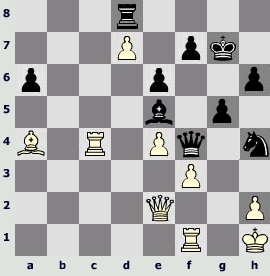 The possible responses of White in the latter – 23...£a3 – are the moves 24.f4, 24.¥b6 and 24.¢g2. All of them are analyzed by the winner quite elaborately. The variants with ramifications! 24...¤e5. It`s a threshold of apotheosis of the truly titanic work. Khalifman proves his many years' analyses (1984-1989) that he`s almost forgotten. But for all that precomputer analyses, i.e. total-lot "human" chess analyses, surprisingly turned to be the analyses of high quality. Computer correcting was minimal in the March 2000! The guileful check with Knight 24...¤h4 was subjected to an elaborate examination. Even the attempt to retest these enormous in size analyses is unimaginable – so vast they are. Judge yourself: it is one of ... a number of three ciphers of variants that were published by the champion. 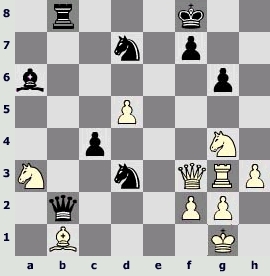 The matter concerns the variant that deals with the game move 24...¤e5. It`s the variant with serial number B4b22322 (it is impressive, isn`t it?). Here it is: 24...¤h4 25.¢h1 £c4 26.f3 g5 27.¥b6 ¥d6 28.¦f2 ¥e5 29.£c2 £b4 30.¦f1 £e7 31.¥d8 ¦d8 32.¦b3 £f6 33.£e2 £f4 34.¦b4 ¢g7 35.¦c4±. The variants ramify intricately in those "points" of chess trajectories, which correspond to the moves 25.¢h1, 26.f3, 26... g5, 27.¥b6, 30.¦f1, 31... ¦d8, 34.¦b4 and 34...¢g7. Such processes are called bifurcational in physics: the variants "split", then the variants of these variants "split" and so on. I again present my condolences to those, who are fond of playing according to plan. I repeat (see also the commentary to the previous game): position at the diagram is only one "real" chess position of ... tens of thousands of possible and might-have-been chess final positions. The estimation of it (the world champion estimates!) is – ±. Where are the precise scales? 25.¥b6. At least eight ramifications(eight bifurcation points). 25...£c4. The incredible number of analyzed ramifications! It`s easy to discover the variants like ... B7a222. It`s the truly titanic analysis! 26.£d4. The general number of noteworthy variants decreases only after that strong move of White. And it`s notwithoutreason, since Khalifman considers the position after 26.£d4 to be a technically won position. 28...¤c5. It`s one of the last bursts of the world champion analytical activity. The variants 28...e5, 28...¤b4, 28...¥g7, 28...¥d6 and 28...¥c5 are subjected to analysis. There are altogether five continuations! Coefficient of position chaotic state – 5/30, i.e. 17%. Check this! 29...¥d6. It`s possible 29...¦ab8... +- . 31...¦a8. Or 31...¦d7 32.¥e3 +-. 33...f5. 33...a5 also doesn`t save the situation. The result is the four theses (see below). They are the base of the "ideology" of "modern" chess theory that I`m preaching up. Attention, please! 1. The model of the chess game will become the dynamic model only when we`ll "inject" in the model the well-known in science principle "linea minoris resistentiae" (the principle of "the line of least resistance"). I`d like to mention, that this principle, which is quite important for every reliable theory, was introduced into the chess theory already by Emanuil Lasker, the second world chess champion. 2. Chess chaos is primary. It represents an infinite number of all possible chess games. In other words: chess chaos is the set of all chess "trajectories" without exceptions (chess tree). Physical analog of this is thermodynamic chaotic systems in Nature. "The laws" – are the rules of the chess game. There is an important detail: the values of all the chess pieces without exception are equal to zero. IncludingthatoftheKing! 3. Having postulated the infinite chess value of the King, we will instantly partially put in order the chess system. There appears the formal chess game (purpose of the game is a check to opponent`s King). It`s important for us, that chaos elements will remain in the system despite switching from the chaotic chess game to the partially ordered one. These chaos elements are ineffaceable. 4. Dynamic system, if it is complicated enough, doesn`t need "supervisor". The system "takes" a decision itself. It "takes" a decision in a random way. In the bifurcation points, when a complicated dynamic system is "sliding" along "the line of least resistance"! 1) G.K.Kaspaov "Two matches". Moscow, "Physical culture and sport", 1987. 2) Alexander Khalifman "History of the old notebook". "Chess Petersburg" N2, 2000. 3) D.S.Chernavskiy "Synergetics and information", Moscow, "Nauka", 2001.